The Puslinch Historical Society received another valuable contribution in January 2018, when our e-mail correspondent, Chris Bowman was notified by Bruce Dawson, that he was searching for a descendant of Alexander McLean of Badenoch, Ontario. We were excited to learn that Bruce Dawson was in possession of two letters, written 1855 and 1857, by George McMartin of Insh, Badenoch, Invernesshire, Scotland to his nephew, Alexander McLean of Badenoch, Ontario, as well as a farm journal or drover’s account book from 1755, which belonged to Donald McLean. 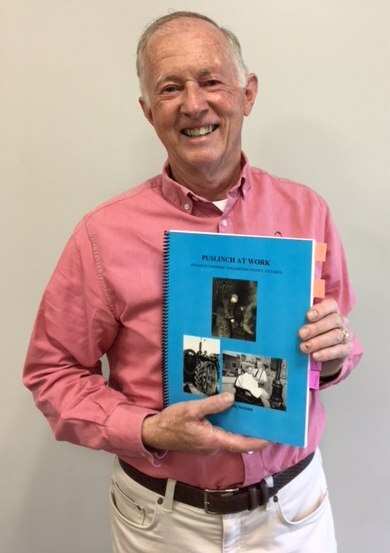 Bruce Dawson was put in touch with PHS member, Lois McLean, great-granddaughter of Alexander McLean and it was determined that the letters were, indeed, to Alexander McLean of Badenoch in Puslinch. He kindly scanned the letters and the journal and sent those scans to us. As a result, we were able to research family members and friends, left behind in Scotland by the emigrants and to add to our knowledge of many of the Badenoch families. 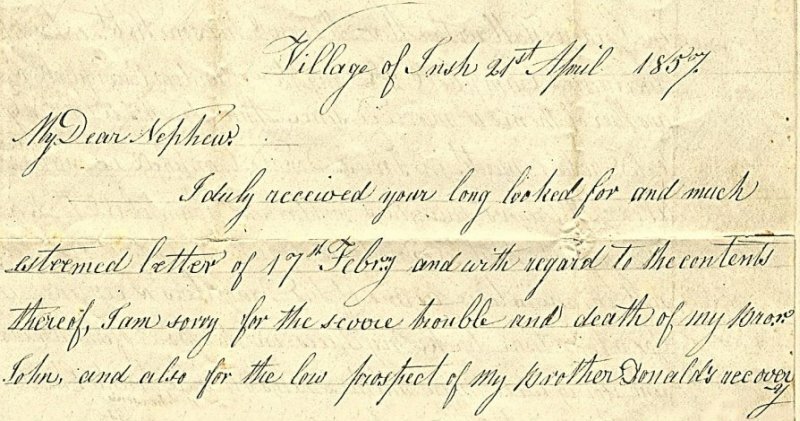 Transcriptions of both letters and of the journal are available for study in the PHS Archive, as well as researched information on the family members remaining in Scotland. If anyone at a distance wishes to see this information, please contact [email protected]. George McMartin was a brother of John Martin and Donald Martin, Margaret Martin, who married Peter McLean and Annie Martin, who married Peter “Linnhe” McPherson, all of whom emigrated to Puslinch Township and settled in Badenoch. George, a mason, retired by 1851, stayed in Scotland, living in Insh village in 1841- 1851. His wife and daughter lived in Insh village in 1861. George born in Insh Parish in 1785, died on Oct. 28, 1857, five months after this letter was written, and was buried in Insh Churchyard. His wife was Anna McDonald, born in Alvie Parish c.1809. They had one daughter, Penelope McMartin, b. Oct. 27, 1836 in Insh Parish. Penelope married Angus McPherson on May 25, 1871. In 1901, she lived in Insh village. She died in 1916 and was buried in Kingussie Churchyard. The introduction of Robert Moore’s book, “Puslinch At Work” on Saturday, June 23rd was a decided success. Robert Moore, a former Puslinch resident, now retired to British Columbia, had been researching and writing this book for about a year. Under the sponsorship of the Puslinch Historical Society, he presented the book for sale at the Puslinch Library. This book covers the history of work in the township from the earliest days on record, beginning with the agriculture of the Neutral First Nation, to the mid-1960’s. In particular, it emphasizes small business in Puslinch during the early to mid 20th century, a subject that had not been well-covered previously, with much of the information not documented at all. This makes the book a very valuable addition to the written history of our township. Robert has done an excellent job with a difficult and wide-ranging topic, which led to contact with many, who were children helping in their familiy business during that time. The crowd, assembled in the Brad Whitcombe Room of the library, listened intently while Robert explained his approach to the book and answered questions. All of the copies, which he had brought with him were sold, with several more requests placed. Due to the demand, Robert released a second printing. A limited number are available at the Puslinch Township Office at a price of $22. This article is from the August 2018 newsletter of the Puslinch Historical Society. The original PDF version can be downloaded HERE.